Amalienborg and its district is part of the Tentative list of Denmark in order to qualify for inclusion in the World Heritage List. Since I was visiting Copenhagen for 3 days, I decided a 10 minute walk to Amalienborg would be worth the effort! Actually, since sunrise and sunset was at approximately 4am and 11pm respectively, I made two visits. The first visit was fortunate in that our arrival coincided with the changing of the guard. The second visit was during the late afternoon a couple days later, since I had the Copenhagen Card, I decided I might as well visit the interior of the palace as well. The exterior is a pleasant white and the symmetry of design of Amalienborg is perhaps its most special characteristic, but like previous reviewers, it would be a stretch to claim any sort of OUV. The interior of the palace is well-maintained, but there is little on display that sets this palace apart from the multitude of other royal heritage sites in other Scandinavian countries. I agree, Copenhagen may have enough for a world heritage city designation, so perhaps Amalienborg will one-day be an important component of a WHS. Yet, speaking only of royal sites in Denmark, there are at least 2 non-WHS palaces in and around Copenhagen that have comparable value, and perhaps could be better argued for world heritage status. That reality leaves any more Danish palace/castles being inscribed as fairly slim. Unfortunately I don't see any reasons why this should be a World Heritage site. Amalienborg is a beautiful palace and the district around it is full of nice buildings but I didn't see anything special that would make it worth of World Heritage status. It lacks the "outstanding universal value". Also Unesco website's description doesn't give any good reasons to add it. 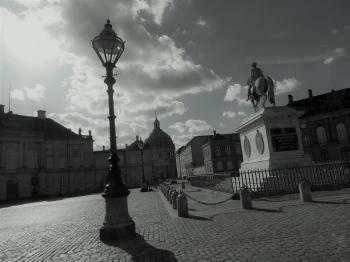 Europe is full of places just like Amalienborg. But Copenhagen as a whole is an amazing city! I'd like to see a nomination containing more historical places in Copenhagen, something like "Historical City of Copenhagen"! Very beautiful and impressive site and vould perhaps be better than the present danish heritages. I am not quite sure of how uniqe it is, there are many beautiful sqares arond the world.